I recently had the chance to interview John Ulzheimer about some of the insights his experiences with the credit industry have given him relating to folk’s behavior when it comes to credit and debt. John is the President of Consumer Education at SmartCredit.com, the credit blogger for Mint.com, and a Contributor for the National Foundation for Credit Counseling. He is an expert on credit reporting, credit scoring and identity theft. Formerly of FICO, Equifax and Credit.com, John is the only recognized credit expert who actually comes from the credit industry. JACKIE: You’re a credit expert from the credit industry itself. What insight has that experience given you into how consumers use (and misuse) credit? JOHN: I think the most important thing my experience has taught me is to interpret a consumer’s credit management actions from a credit reporting, credit scoring and lender’s perspective. Most consumers don’t think that way and they don’t realize that almost all of their actions are measured, scored and reported. And, that there are rewards for using credit and using it properly and that there are penalties, long lasting penalties, when they abuse it. JACKIE: What insight has it given you into people’s reasons for wanting to become debt free? 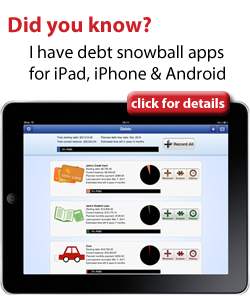 JOHN: It has taught me that people have become unnecessarily obsessed with being debt free. Being debt free means no mortgage, no auto loans, no student loans, and no credit card debt. That’s not realistic and it’s not healthy to pay cash for everything because liquidity has value as well. Living credit card debt free is the real goal since carrying that kind of expensive debt has no value to the debtor. JACKIE: Interesting. I guess my definition of debt free technically wouldn’t truly be debt free then, because to me it means not having a mortgage, student loans, car loans, you-name-it loans, and not carrying credit card debt. I still intend to use credit cards after having our mortgage paid off, but will continue to pay them in full each month. I guess that is still a loan though. JACKIE: How do you interpret paying cash for everything as not having liquidity? JOHN: It’s simple math. If you write a $30,000 check for a car rather than financing it at 5% (or 0% for some models if your credit is good enough) then you no longer enjoy the liquidity of having that $30,000 to do other things like investing. If you’re so wealthy that paying cash for all of your major purchases still leaves you sufficiently liquid then you’re atypical and things like “credit and debt” are much less meaningful to you. JACKIE: It’s pretty common for people to start out with the idea that they’ll only use a credit card for emergencies, and then end up deeply in debt before they know it. What would you say to someone who is just starting out with credit that might help prevent that from happening? It seems like oftentimes the good intentions are there, but the follow through is lacking. JOHN: Good question. The reason some consumers are such poor managers of credit cards is that nobody has taught them how to manage it otherwise. There is no class at any school at any level of education designed to teach their students how to function properly in the credit environment. Because of that consumers tend to learn about how bad poor credit management can be the hard way…by living it. The most effective way I know how to teach someone the downside to abusing credit cards is to explain how collectors and collection attorneys can ruin your life. The room always gets really quiet when I talk about that to my students. JACKIE: Could you give an example of how they can do so? JOHN: A debt collector can turn one defaulted debt into multiple credit reporting events. Example, say you default on a $5,000 credit card and the bank sells it to a debt buyer/collector. They will report it to the credit bureaus. Now it’s showing up twice (original default and new collection). Then, if you ignore them long enough they’ll likely sue you, which you’ll probably either ignore or lose. That means you’ll have a new judgment, which can be reported on your credit files. Now it’s showing up 3 times. Same debt…3 credit entries. It can get worse if the collector sells the debt to another collection, who then reports it again to the credit bureaus. Add to this the daily calls you’re getting from the collectors and the possibility that your wages will be garnished after the judgment has been rendered, it’s not a fun way to exist. JACKIE: Thanks John, for the interesting discussion. It sounds like there are a lot of things related to the credit industry that most people don’t give a lot of thought to. And I sure never want to get another call from a collector — once was enough for me!